A short demo on how to get started with Java 8 in Eclipse presented at Eclipse Demo Camp Bangalore, January 2015. Eclipse Luna – What’s New! A short introduction & demo on what’s new in Eclipse Luna (4.4) presented at Eclipse Luna Demo Camp 2014 – Chennai, India. Java SE 8 is the most significant expansion of the Java programming model yet and Eclipse Luna (R 4.4) has been reloaded to be ready for Java 8. Eclipse Day India 2014 – Coming soon !! 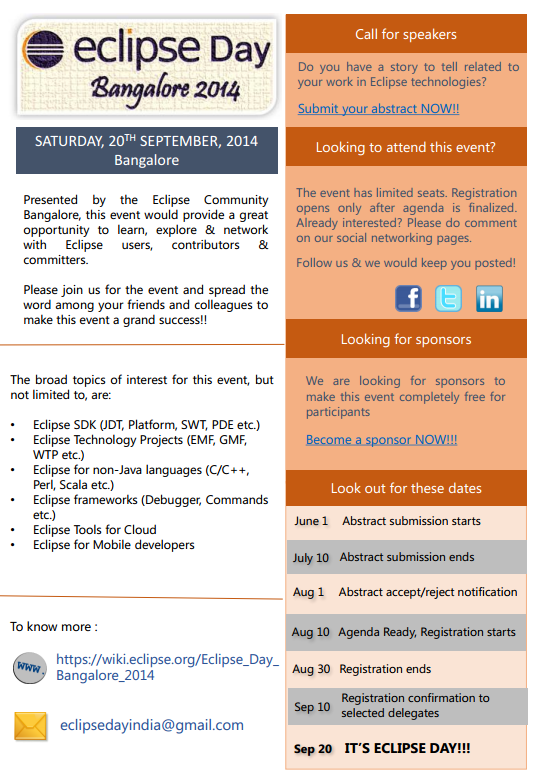 Eclipse Day India 2014 is coming soon to Bangalore !! Java 8 is coming. It is happening right here. Developers of your favorite Java IDE are participating in shaping this long awaited milestone for the Java ecosystem: On time with the GA of Java 8, JDT will ship its first release with support for developing in Java 8. If you have a basic understanding of the new features in Java 8, come here and learn how the JDT team mastered the challenges of lifting the Eclipse Java IDE to the next language version. The main focus of this talk will be on lambda expressions, touching also some changes in the libraries that leverage lambda expressions. We will expose some examples demonstrating the complexity of the language and mention some caveats which should help you avoid some unpleasent surprises. We will demo how to get started using Java 8 in Eclipse and show the latest tool features for working with lambda expressions including new quick assists etc. Finally, we’ll give a retrospective discussion of the situation of the JDT team, in terms of team changes, contributors, deadlines, interaction with expert groups, with the Eclipse community, and more. Eclipse provides a lot of powerful features and capabilities as an IDE. With so much functionality at your disposal, there is a lot of functionality that is very useful, but not easily discoverable. To be productive, mastering your IDE is as important as mastering your source code. In this talk, I will unleash many invaluable tips and tricks that will allow you to better use the Eclipse IDE and make you more productive in your routine development tasks. During this talk you will have many “Ah, I didn’t know Eclipse can do that!” moments. Poster presented on “Eclipse and Java 8” at the Grace Hopper Celebration of Women in Computing India (Bangalore) 2013 (a program of the Anita Borg Institute, co-presented with the Association for Computing Machinery).